Four-piece Merkel Compact Seal L 27 comprising one pre-load component (NBR), two active back-up rings (POM) and one PTFE bronze profile ring. 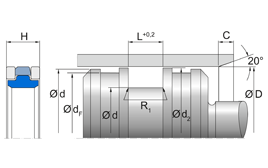 The Merkel Piston Seal L 27 is used where a piston has pressure on both sides. 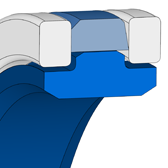 The activated back-up rings offer good protection against extrusion even with gaps for breathing.